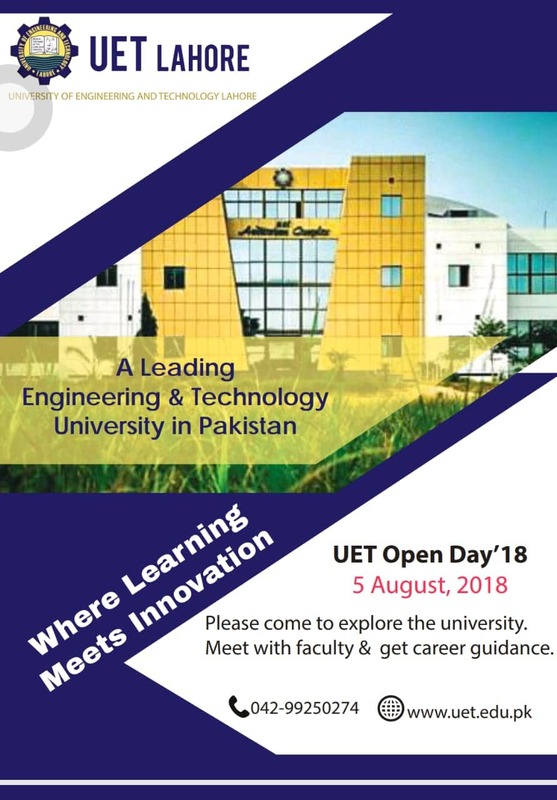 University of Engineering and Technology (UET) Lahore is going to organize Pakistan biggest engineering carrier counseling event "Open Day". Faculties of university will provide information about different undergraduate programs of university. More than fifty thousand candidates from all across Punjab are expected to attend this event. Talking about event Vice Chancellor UET Prof. Dr. Fazal Ahmad Khalid viewed, "Proper carrier counselling plays a vital role in professional growth and progress of individuals. The events like "Open day" enable students to know about their potential, aptitude and proves very helpful in planning their carrier". The information like scholarships, fee concession and admission procedure will also be made available at different stalls. Considering tough weather conditions special arrangements for drinks and transport has also been made.